Are you looking for a high quality mattress grade vinyl dog cover? 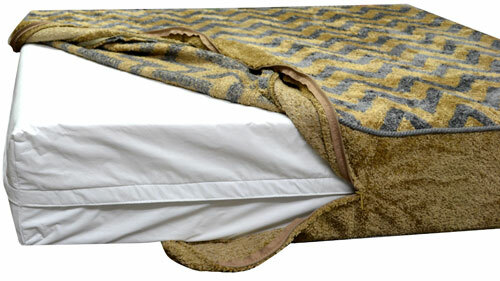 Smart Pet Beds offers protective waterproof dog covers that can be used to protect the insert inside your dog's pet bed. In addition to offering liners that supplement our supreme, executive, royal, and standard series pet beds, we have liners that can also be purchased separately for use with other dog bed brands. In the event that you already have a dog bed and only want a Smart Pet Bed waterproof cover, Smart Pet Beds is here to help! Why is our waterproof pet cover a great option? 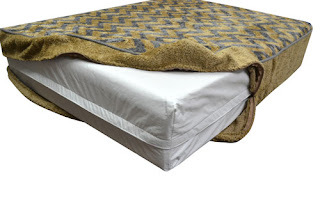 Firstly our liner is 99% waterproof and constructed with top mattress quality quilted vinyl. Second, our unique double flap zipper design prevents moisture, water and dirt from entering the insert through the zipper. The extra long zipper on the liner allows for easy removal of the memory foam insert (supreme/executive line). Choosing the appropriate water liner for your pet's bed is essential and we have the following dimensions available. Please refer to the charts below to make your selection. never thought there are waterproof covers for dogs mattresses. would love to have one of this. Is Your Dog's Bed Good Enough?